Fixit is a highly supportive, all-steel bike repair service tool great for cyclists communities. 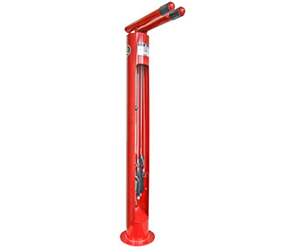 Designed with a thick steel body and innovative hanger arms, the repair station is capable of supporting all types of bicycles. Placing the bicycle on the hanger arms allows prime access to the attached tools and unrestricted movement of the wheels and pedals. 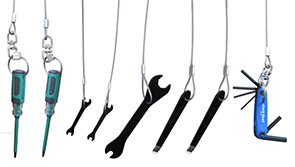 The all-steel FixIt features a Phillips and Flat Head screwdriver, headset and pedal wrench and various sized Allen and Box wrenches, which are secured to the unit by 5/32" braided stainless steel aircraft cables. For added convenience the screwdriver and Allen wrenches feature swivel connectors.